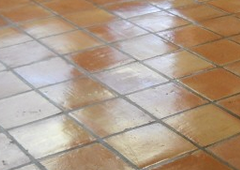 Do Your Tile and Grout Surfaces Look as Good as They Used To? Grout is the one reason that keeps people from loving their stone and tile floors. But, grout does not have to be an issue. Diamond Stone and Tile Care has a grout colorant process that will restore your grout to the color you want it to be. It will also give the grout a stain resistance so that you no longer have to worry about every little thing in regards to the grout. Diamond Stone and Tile Care is the best tile and grout cleaning and restoration company in the Hilton Head/ Savannah area. Barry Raduta personally provides free estimates to evaluate your project and to properly price the work. His honing and polishing process is moisture-based and NOT a dry process, so he does not create dust within your premises. Barry took my totally scratched, etched and discolored foyer marble floor and restored it to a white and glossy masterpiece. I never thought that it could be done, but he did it. Thanks. My black granite countertop shines like the day we installed it over two years ago thanks to Diamond Stone & Tile Care! They sealed it and polished it to a luster that I never thought was achievable. I highly recommend their services because Barry is a great guy on top of being a professional restorer of stone.